The famous purchases of the Prince Regent, an ardent art buyer, provided a royal boost to the commodification of art in London, the first true "world city" of capital speculation, spectacle and display. Having one's portrait done by a painter of prominence was a common way of declaring one's social importance. 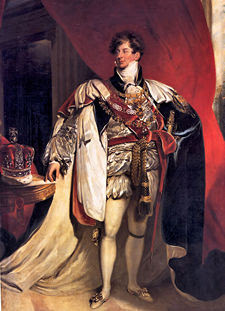 The most successful of the portrait painters was Thomas Lawrence, noted for his remarkable ability to provide "improvements". Lawrence famously "improved" (i.e. shrunk) the exceptionally large nose of the Duke of Wellington, and limned the dissipated fifty-two-year-old Prince Regent as, in the words of William Hazlitt, "a well-fleshed Adonis of thirty-three": Hazlitt had fun imagining the "transports with which his Royal Highness must have received this improved version of himself". As is seen in Thomas Rowlandson and Auguste Charles Pugin's "view" in Rudolf Ackermann's Microcosm of London -- a mirror representing the city and its manners and mores to itself -- the Royal Academy collection crowded the walls of a new repository, Sir William Chambers' Somerset House. With the rise of the new "middling" commercial classes, the "fine arts" became, almost overnight, taste indicator and investment opportunity. There were, of course, a few who saw the humour in this. Generally these few derived from the class above. What is the end of fame? The complex meanings of art as a cultural marker were being further expanded and complicated with each passing minute in this fascinating and curious period. Much of the intricacy of the class-based taste-standard issue is probably lost on us now, but a certain flavour can be captured from the acute social sensibility of Byron, whose remarkable comments on Keats ought to dispel once and for all any illusion that the "Romantics" were a happy gang of brothers, yukking it up by a Lake or on an Alp like a troop of boy scouts on a nature outing. A few years ago, I made a version of Sir Thomas Lawrence's very good portrait of George IV, using Photoshop, in which I substituted a goat for George. It was a lot of work, but quite successful. I think it's on my old computer, unfortunately. You know, Artur, I could very easily imagine the heads of one of your goats fitting quite suitably atop this figure. this Lawrence bust... Prinny in his younger, more goatish period (c. 1814, aetat. 46)? Might have given you a bit more head room to work with. ...but at "the end of the day" (well, night in the case of this print), I believe, the better likenesses of the Prince Regent came not from the official, commissioned sittings, but from the caricaturists. In particular this wonderful Gillray (The Lover's Dream) was said to be a pretty good resemblance. The print was issued just before the Prince's marriage to Caroline of Brunswick, and Gillray, like most of his fellow Englishmen, assumed the motivation for the union to be the Prince's desire to pay off his gaming debts and hike up his allowance. We send the same back to y'all, Curtis. I think it was actually this one. I must say, I hadn't realised he'd churned out so many.